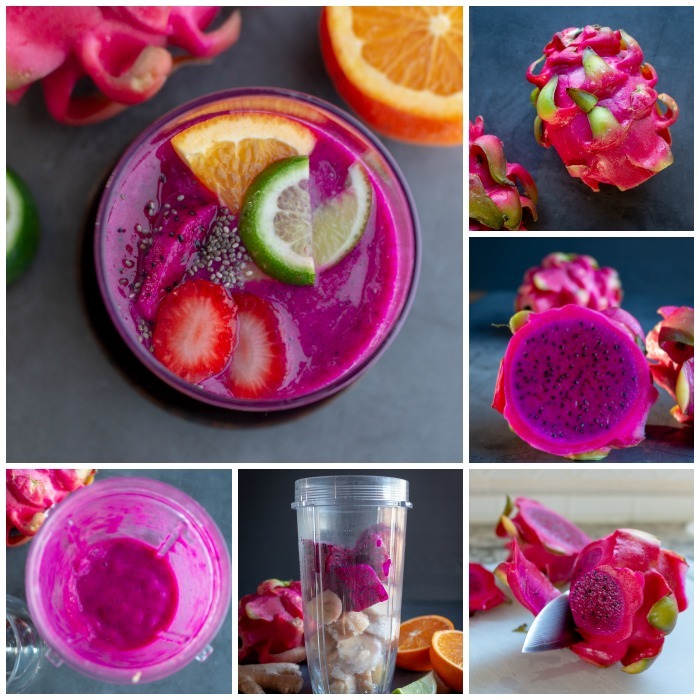 You are just going to love a Ginger Citrus Dragon Fruit Smoothie because they are simply delicious and refreshing. You are going to love the smooth naturally sweet red dragon fruit paired with the sparkle of the ginger and citrus. A fabulous pairing that transports you to a tropical place. Mother Nature is a real prankster. On the eve of April 1st, she gave us another snow storm. Can you believe it? Of course, you can as many of you are enjoying the snow as we speak or on a plane to enjoy the spring like weather someplace south. If you can’t afford to hop on a plane, take a little mini “Spring Break” holiday in your kitchen. You can make a 5-minute Ginger Citrus Dragon Fruit Smoothie and you will forget all about that “white stuff “on the ground. Get ready to don your itsy bitsy teenie weenie yellow polka dot bikini or swim trunks. If you can close your eyes and imagine yourself on the beach with the warm sand between your toes sipping on a delicious Ginger Citrus Dragon Fruit Smoothie you will be transported to a tropical holiday. 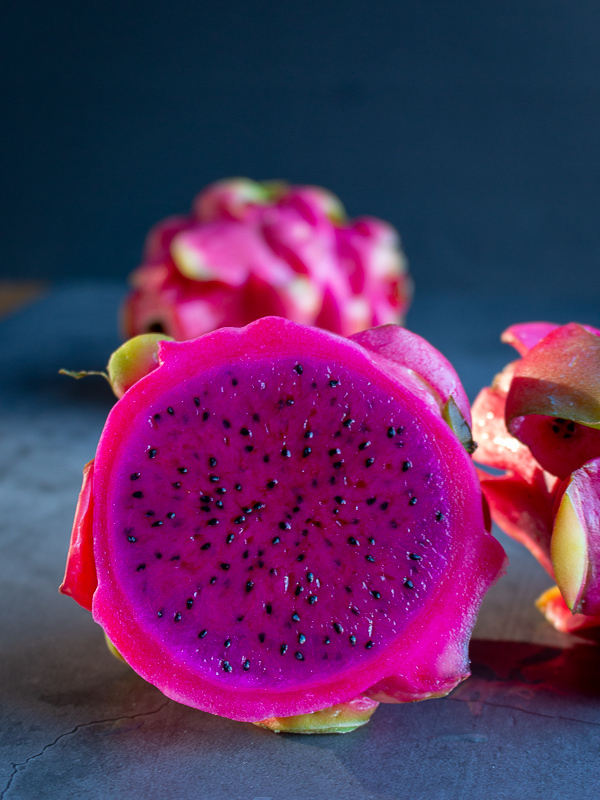 We think dragon fruit has the texture of like a kiwi because of the little edible black seeds. When it is at the peak of ripeness, dragon fruit will be sweet and mellow tasting. Dragon Fruit really do not have a distinctive taste of their own but pick of the flavors of anything you mix them with. That is exactly why we paired them with a little banana, fresh grated ginger, oranges and limes. There are 2 types of dragon fruit. A white dragon fruit with black seeds and a bright red purple dragon fruit with black seeds. 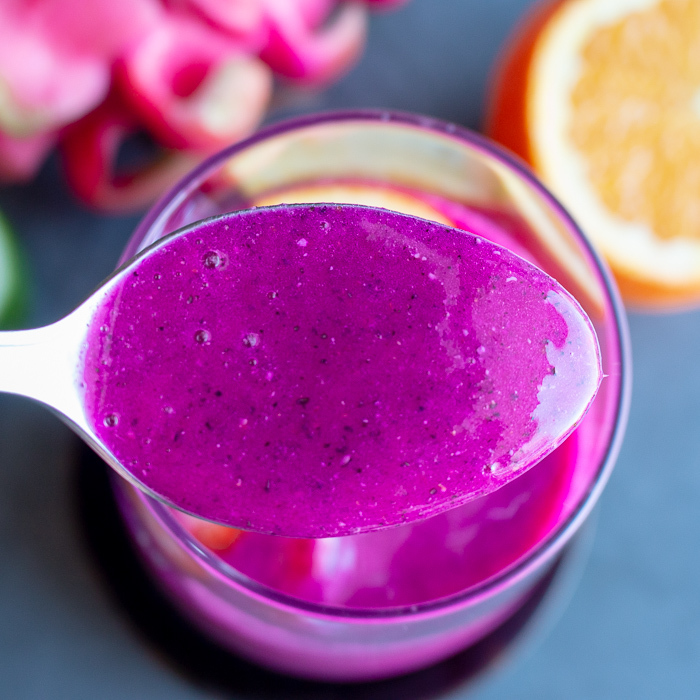 The bright red purple dragon fruit makes a stunning vibrant smoothie, but a white dragon fruit smoothie is equally delicious. Where can you buy Dragon Fruit? Dragon fruit is also called pitaya. Dragon fruit is grown in tropical areas like Southeast Asia, Southern Americas, Caribbean and other tropical regions. The peak harvest season is generally between May and through the summer. If you live in a tropical area, you will be able to purchase fresh dragon fruit at the market. You can also find fresh dragon fruit in Asia Markets. 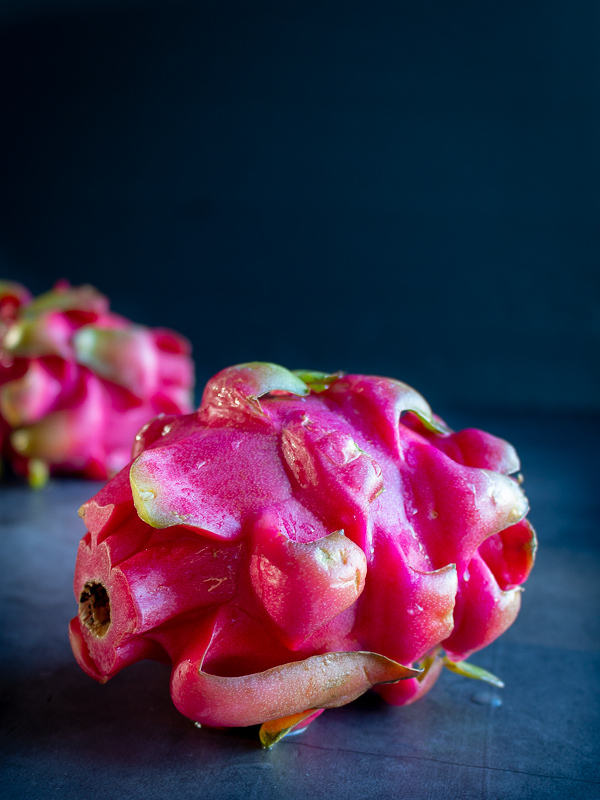 However, if you do not live in a tropical region, you can buy frozen dragon fruit (pitaya) all year around in the grocery stores in the frozen food section. Can you believe they even sell frozen dragon fruit at Target? 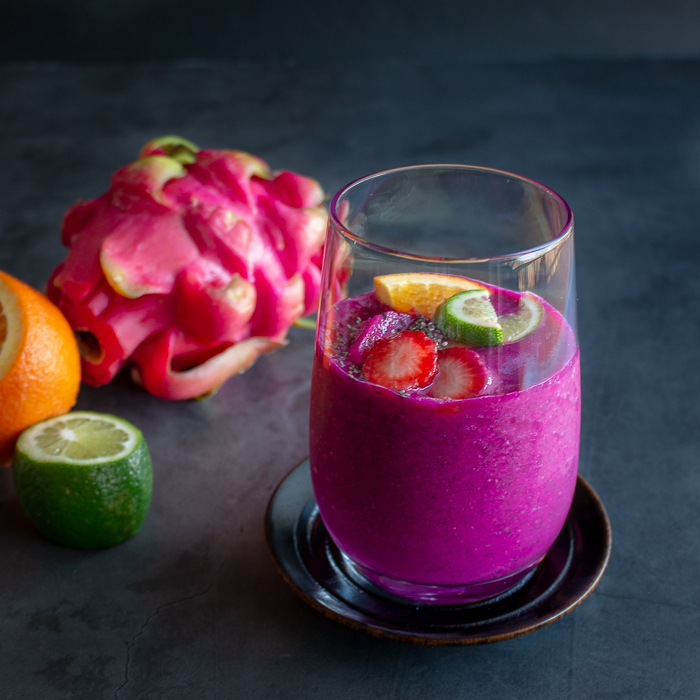 How to get your Ginger Citrus Dragon Fruit Smoothie to the right consistency? 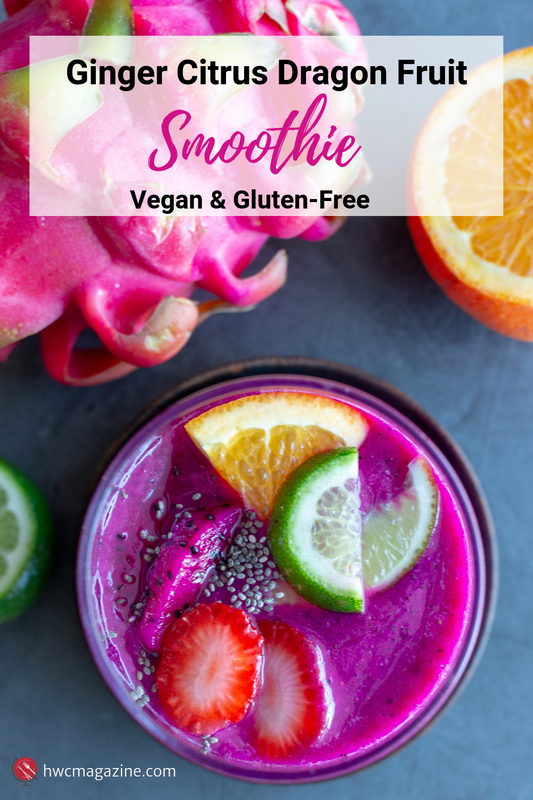 If you are looking for a dairy-free, vegan and gluten-free beverage or snack, Ginger Citrus Dragon Fruit Smoothie is going to be your new go to treat. We used the juice of a whole orange, juice of half of a lime to get the blender going. However, you could use grapefruit, pomelo, limes or any fruit juice you desire. We kept our smoothie completely natural and did not add any sugars, honey or anything other than fresh fruits to sweeten. The key is making sure your banana is ripe or even over ripe. When we buy too many bananas and can’t use them up, we peel them and put them in a baggie and put them in the freezer. Chopped frozen bananas are a quick and easy way to add sweetness and thicken your smoothies. According to Traditional Chinese Medicine, bananas, dragon fruit, oranges and lemons are cooling fruits. In order to balance this recipe, we added freshly grated warming ginger. If you have a spleen qi deficiency or cold disposition (cold extremities, tiredness, lethargic, etc. ), do not use frozen bananas but instead make sure all of your fruits are at room temperature. Spleen deficiency can be complicated by eating cold raw foods. You may wish to add papaya, mango, lychees, longan or cherries to add some warming fruits to the mix too. In addition, do not drink this every day as it may weaken your disposition. However, if you have a heaty disposition (feel hot all the time, red face, thirst, etc.) then this recipe is catered for you. The fruits are cooling. However, even if you suffer from a heaty disposition, it is best that you do not eat iced cold food and your fruit should be at room temperature. As you remember from our Feed the Spleen; Nourish the Body Post, that everyone must follow the specific rules of not eating cold or iced foods. When you eat or drink cold items, your gut has to work really hard to warm it up and get the vital nutrients to us. We know when it is hot outside that is all you want is a nice icy drink but that just causes your gut to shut down and you will start to have health issues. It’s all about keeping the balance. 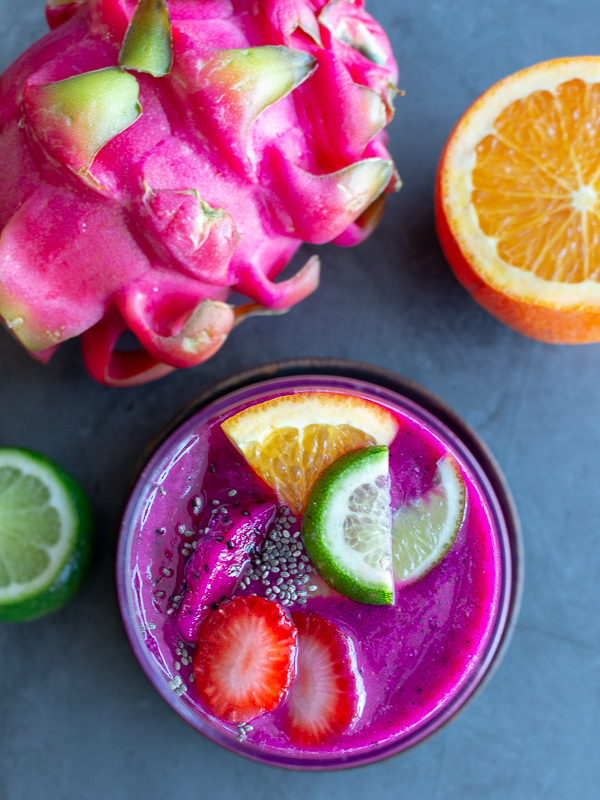 Did you make our Ginger Citrus Dragon Fruit Smoothie? Follow us on Instagram, post a photo and tag us @hwcmagazine or #hwcmagazine. We love to see what you are making! 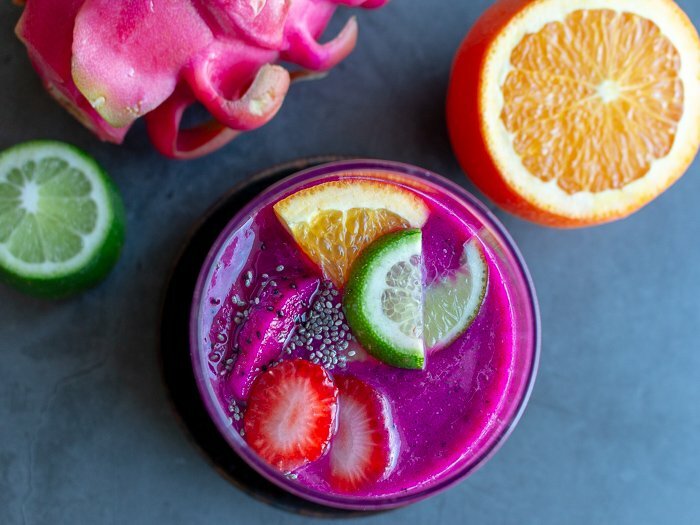 1In a blender, add chopped banana, dragon fruit, juice of 1 orange, juice of ½ lime, and 1 teaspoon of ginger and blend until smooth. 2Garnish with fresh fruits, chia seeds or whatever your little heart desires. Enjoy! 3Chef’s notes: Feel free to use any types of citrus juices you desire such as grapefruit, pomelo or lemons to make your Ginger Citrus Dragon Fruit Smoothie. In addition, you can use any additional fruits like berries to this smoothie. You can use either use a frozen banana or room temperature banana in this smoothie. Several grocery stores carry frozen dragon fruit (pitaya) chopped in the frozen food section of markets. If you do not have fresh ginger, you can substitute with ¼ teaspoon of dried ground ginger.